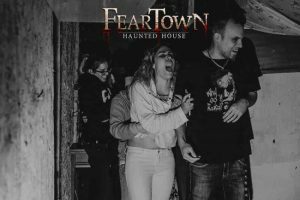 Fear Town is a large Halloween destination at the Seekonk Speedway in Seekonk, Massachusetts, with several attractions. 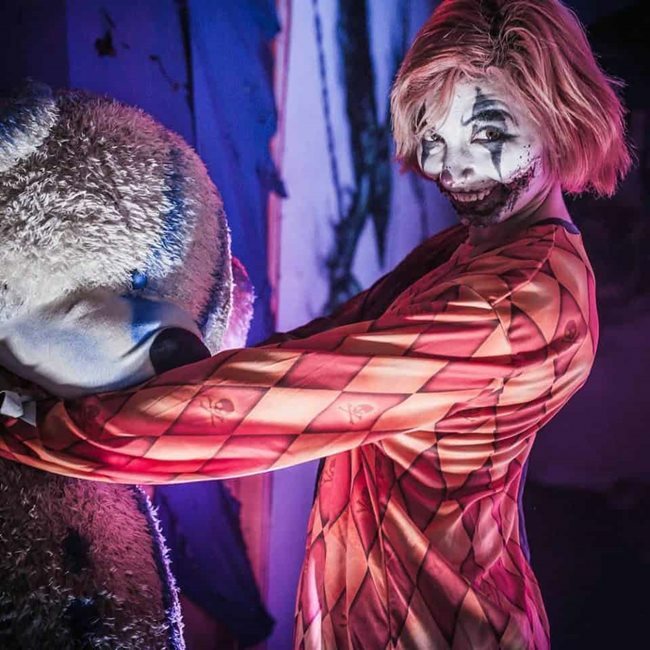 Much of the place seems to have a low budget, but they use theatrical effects and interactivity to make it a top Halloween place to go in New England. Better signage is needed. From the main road, you’ll see the main Seekonk Speedway sign, and a worker will wave you to the back of the main parking lot and to the far left. From there you’ll circumvent the Speedway race track to the field and forest behind. Parking is free and there’s plenty of it. If it’s not cloudy overhead you’re far enough from the city that you’ll see stars from the parking lot. First you enter a central area, a clearing where costumed actors roam to spook and entertain you. There you can wait for timed entry into the attractions or try your hand at carnival games. They sell t-shirts, gloves, cotton candy, candy apples, hot apple cider, or you can buy an adult diaper for your scaredy-cat friends. You’ll find portable toilets, a caricature artist, axe throwing, and you can throw a ball to break plates mounted on a rack, or to knock out teeth from oversized spooky heads. A new attraction, The Possession, is a stunning creative twist on a haunted house that I’ve only seen elsewhere at the House of Seven Gables in Salem. Normally, you walk through a Halloween house to find actors who shriek at you, hoping to startle you. Elsewhere, you may find actors who have one or two lines to say to you, a theatrical performance. At Fear Town, they take that concept to the next level. Each room is a three-minute one-person play where spooky actors interact with the audience. You participate in chanting through an exorcism, sit and get attended to by an evil nurse, attend a funeral where the pews move on their own and a dead child goes wild, and then hunt for a teddy bear in order to placate her so that you can survive. Or climb into a casket and have the lid close above you. Actors are permitted to touch you lightly. It’s even more impressive because it’s all done with the lowest budget in terms of costuming and set design. The enter Snozzer’s Fun Center, a 25-minute walk that takes you through the woods, mostly outdoors, but also passing through buildings. There was good spacing between groups, but 6 people made a group large enough that those in back didn’t get scared as much by actors who startled guests mainly from the front. On one hand, the walk featured too much junk such as old barrels, random fencing, unpainted plywood, sheets with ripped holes meant perhaps to be spiderwebs, and even a rusted washer/dryer. At night, the woods are beautiful and spooky to walk without any decoration except perhaps ribbon to mark the pathways. In some places it was slightly too dark. You’ll have to watch your step on the forest pathways, where you’ll find tree roots, and in a couple of the buildings — the cat lady has a surprise half-step down, and just after the shower stall maniac there are mattresses you can stumble over. However, there are several high points to the tour. You’ll see an amazing monster crouching on all fours with stilts on both arms and both legs. There’s a cat lady house where actors play feral cats above and below. One actor swung out on a rope from above. Madame Guillotine commands from you a stage and has a real guillotine. Rabbit Joe eerily gets you to sing Little Bunny Foo Foo. There’s a big diorama of a house front shaped like a giant wailing face. Best of all, you’ll find a fog room with a laser making a plane of light, like it’s a glowing lake. Monsters pop up from “underneath” the lake. In another room, lasers make an artificial wall to hide monsters. It’s the most impressive horror effect that I’ve ever seen. That being said, it’s the only special effect at Fear Town, which has few mannequins, no animatronics, and no fog effects elsewhere. However, you can climb through a building that’s tilted on its side. And you’ll find some smaller kids playing monsters, too. The actors are dedicated and many just growl but most have a small scene to act out, including the surreal lines, “You all seem like professional housekeepers”, and “Try some novelty soaps!” As you can expect with any woods walk, groups may bunch up a little, even groups are only let through every couple of minutes. 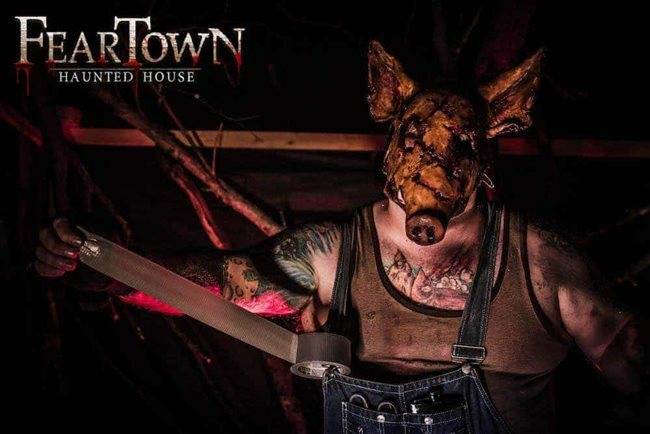 Fear Town also features two 5-minute “escape rooms” that we didn’t get to try, because, at 5 minutes per group, the lines move glacially slowly. In The Crematory, I understand that someone from your group gets locked into a cremation chamber and you have to save him or her by solving puzzles. They also have The Forest of Dolls, another escape room. Emerging guests told me that these attractions, while creative, were overly difficult and also low budget in terms of props and set design. Fear Town is a place of extremes. In many places, the quality of the costuming and set design is at the charity, unfunded level. But I’ve never seen such amazing and extended theatrical scenes before. It has no animatronics and few special effects, but the two that it does have — the laser rooms — is out of this world great. Its central zone gives you plenty to do, and the timed entry makes waiting in line less painful. 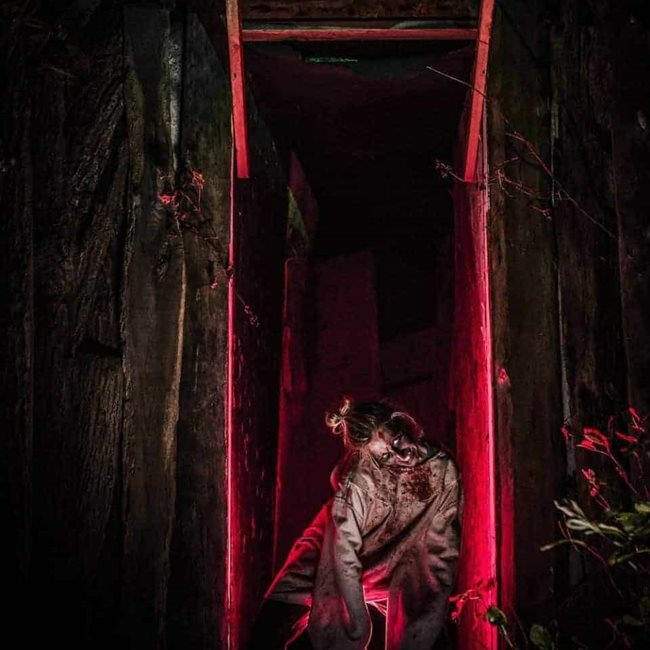 The woods walk is wonderfully extensive and there’s just so much to do at Fear Town. You really can spend an entire evening there! At the end of the season, in early November, you can return for their “Extreme Fears” event, which I believe is a lights-off version of their attractions. I’ll give 5 stars again to Fear Town. They deserve an investor to offer funds for theatrical set design to match their theatrical acting. It’s a spooky delight.